The Blog Train is pulling into the station; it’s the end of the line for the Muse authors of books for young adults and middle grade readers on Stories a la Mode. It’s been fun and exciting to get to know the other eleven writers who signed on for this excursion. My last guest is C. K. Volnek, also known as Charlie. 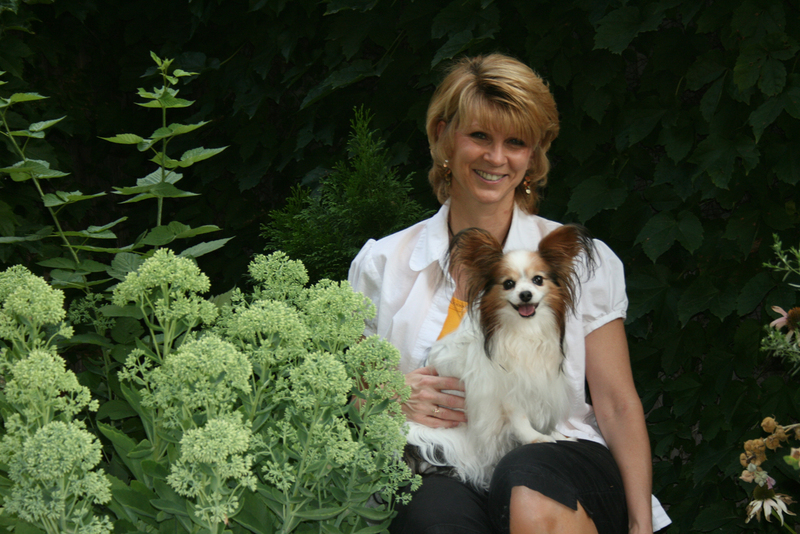 She’s written a book that has great appeal to this Native North Carolinian—Ghost Dog of Roanoke Island. I remember studying about the Lost Colony when I was in grade school. I think it’s a subject many people have pondered, and Charlie has taken on the job of discovering more about those long-ago happenings—even if she has to make it all up. And with her amazing imagination, she has created a mystery within the mystery. Now, let’s find out a little about Charlie herself. See what choices she would make—or not. Hi, I’m C.K. Volnek, author of tween novel Ghost Dog of Roanoke Island, which became available September 23rd, through MuseItUp Publishing. This interview really has nothing to do with my book, but it was fun to answer these unusual questions and help you get to know who I am. Though as you get to know me, I hope you’ll choose to find out more about my book as well. I’m also so excited about my book birthday, I’m giving a FREE e-copy of Ghost Dog of Roanoke Island to one lucky reader who leaves me a comment. Good luck! Puppies or Kittens? Oh, they’re both so cute, especially with the new you-tube videos of the stick-up kitty. But my heart still belongs to the canine side. Puppies can only warm my heart and make me smile. They are filled with unconditional love, crazy happy to see when I’ve only been gone ten minutes and always willing to bear a shoulder when I’m sad. They have provided many a laugh, much affection and tons of acceptance. To me, they are just kids with fur and I can’t imagine my life without them. Beach or Lake? Having grown up in the middle of the United States, and I mean literally the middle…I loved our vacations to the beach. Feeling the sand between my toes, gazing at the beautiful blue-green ocean and searching for iridescent seashells were thrilling. But I still enjoyed coming home to the lakes surrounding my home. The ocean is powerful and massive, wild and untamed while lakes are serene and picturesque, stunning and majestic. Dream Lake in the middle of the Rocky Mountains rivals all my memories of our beach visits. Paperback or Ebook? Noooooo. It’s so hard to choose. My hubby got me a Kindle for Christmas and I absolutely love it. Even my hubby, who said he would never read off a Kindle has been found downloading books. But, call it vanity, I still can’t wait to see my books in print form, to feel them in my hands and be able to autograph it to favorite family members and friends. Soda or Lemonade? I like Lemonade, but I’m still a soda fan. There’s just something about the bubbles fizzing and popping in my mouth, tingling as they make their way to my stomach. I know I shouldn’t enjoy it so much, but Diet Coke is my one major vice. Green or Blue? Oh, please, give me yellow. I love the sunshiny happiness of this color. I can’t help but smile when I see it. Plus it only reminds me of the sun. Yes, I’m a fair-weather lover. Give me summer any day. Werewolves or Vampires? I do love paranormal books and movies, but I really don’t like either Vampires or Werewolves. Sorry to all the Twilight fans. Give me a creepy monster or something less human. Romance or Urban Fantasy? I enjoy both when there is a strong hero or heroine with lots of room to grow. Give me a character I can empathize with and I’m with you. Mustard or Ketchup? Depends. For burgers and fries, nothing like a thick glob of ketchup. My hubby says I can never enjoy my burger unless it’s ‘messy.’ J But for a turkey or ham sandwich and nothing compares to a good honey mustard. Mmmmm. Day or Night? They each have their distinctive moments. I love daytime…a nice walk in the morning or evening, a day at the lake or park, or meeting friends and family for lunch or dinner. But night time is ‘my’ time. My hubby is an early bird and I’m a night owl, so that’s my time to be alone…to write, edit or create whatever my muse leads me to. Now that you know me a little better, I hope you’ll take a peek at my Tween novel, Ghost Dog of Roanoke Island. In 1587, 117 colonists disappeared from Roanoke Islandwithout a trace, leaving behind not only unanswered questions, but a terrifying evil. With the help of newfound friend, Manny, a Native American shaman, and an elusive Giant Mastiff, Jack must piece together the clues of the Lost Colony to discover what really happened. Shrouded in ancient Native American folklore, it’s up to Jack to uncover what the evil is and why it haunts his island. But can he destroy it…before it destroys him? You can find out more about me and my books at my website, www.ckvolnek.com. E-mail me at ckvolnek (at) yahoo (dot) com. I’m also on Good Reads and Jacket Flap. You can also watch my book trailers on youtube at http://www.youtube.com/watch?v=RbJEF9TjZzo or by selecting ck volnek. as well as Amazon and many other fine book locations on-line. Thanks for stopping by! 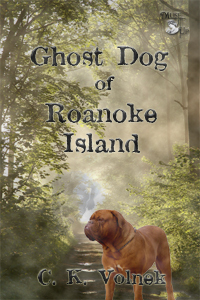 And remember…I’m giving a FREE e-copy of Ghost Dog of Roanoke Island to one lucky reader who leaves me a comment. Good luck! Charlie, it’s been a pleasure reading all about you and your book. Thanks for being my last guest on the Blog Train. It’s been quite a ride, hasn’t it? I’m so glad I got to know you and the others better. Now I must read all of these books and review them for my readers. Hey, I hope I’m lucky enough to win one of the free books. And how about you out there in cyberland? Be sure and leave a comment for Charlie. And here is a reminder that the free Muse Online Writers’ Conference starts on October 3, a little earlier this year than before.